Once Mithra from Lulukoko unlocks around Summer 24, she'll stop by to tell you about her work as a historian and ruins researcher. She has an engraving that explains how to unlock the mysterious door behind the alter at the shrine in Lulukoko, but she may need your help in deciphering it. She'll have you help her with placing a Turnip at the alter that unlocks the door leading to Witchie's slumbering chamber. Now that she knows the information on the tablet is accurate, Mithra is anxious to locate and decode the remaining engravings. The process of how this works is pretty simple. As you discover the stone engravings, Mithra will use her knowledge to decode what's written on them. 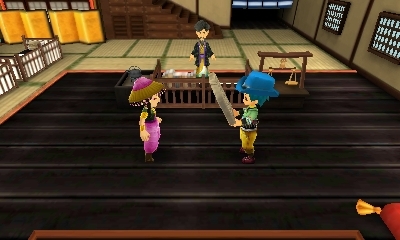 You then find the item hinted on the lithograph and use it at the Lulukoko shrine to unlock the door. Then collect the prize and move on to the next tablet. You obtain an engraving from a variety of sources. The notebook inside Mithra's house will give you a clue as to where you can locate the next tablet. After you obtain the tablet, Mithra will then appear and take it from you (auu...) so she can research it. Visit Mithra's house between 6:00 and 20:00 - the two researchers do not need to be inside the house for this cut scene to trigger. Mithra will tell you the name of the tablet (mouse, cow, cat, and so on). She'll read off the ruins and then explain that she needs more time to research the characters. The next day or later, go back to Mithra's house and she'll be hard at work deciphering the tablet. She will need a research tool to help her, but she doesn't have all of funds to pay for it. This is where you'll volunteer to pay the remaining amount she needs for her research. If you don't pay, then you'll be stuck here on Step 3 until you fork over the funds. Academic research isn't cheap! Go back again to their house on another day and Mithra will tell you that she has finished decoding the engraving. She will then tell you the clue to the item that you need to find to bring back to her. You can review the clue by going to Mithra's desk and accessing her Notebook, where you can see the current clue as well as the list of past ruins you've figured out. Once you figure out what item the riddle, bring it to Mithra and hand it to her. If it is the right item, together you'll go to the ruins to place the item and the tablet on the alter. After the door unlocks and Mithra investigates the room, go inside and you'll find the prize. If the item you give to Mithra is the wrong one neede to solve the riddle, Mithra will simply take your item as a gift offering. After you find the prize inside the ruins, the cycle repeats back at Step 1. In total there are 11 stone tablets to decode. They become more expensive the more you've unlocked. After you collect the prize for the last tablet, you'll learn why the tablets exist.